Thank you again B’man. Especially for your patience to re-edit the video, due to the typo. Please click the little white button at the bottom of the screen to read the English translation. The Truth will out Sylvia – thanks to brave people like you. B’Man’s done it again. Great work! When we hurt any other sentient being, any other soul – we hurt ourselves. Only when we realise at a deep deep level, that we are not really separate at all. We are not separate villages, separate states, separate countries, separate people’s and even separate individuals. But instead we are all beautiful souls. Individual spiritual droplets in this vast ocean of consciousness. OK, so we’ve established ‘it’s the Jews’. But is this accurate? Is is Truthful? Are we really being honest with ourselves? Or is there more to all this than this simplistic them and us division? Firstly – Is it every single Jew, making every single Jew responsible, complicit? Is every single Jew guilty? Secondly – How about us; are we so innocent in all of this? What has our role been until now? Lets take the first area of ‘It’s ALL the Jews’. This one crops again and again. And I feel there are some grey areas. Lets take a lower level Jew – say a cab driver in North London called Jacob. He pays his taxes, gets up out of bed each morning with a bad back, having to do his round; to pay his mortgage, to keep up the endless ever-increasing utility bills. Has a family to support and all the financial worries of modern-day living. How about him – is he guilty of criminality? This needs to be openly talked about. Are we in the Jew-wise community criminalizing Jacob? Well, I suppose it depends. Jacob A or Jacob B. It depends if Jacob A is just going about his humdrum life, just like any non-Jew. Watching tellee, playing the odd game of badminton, going up to Sainsburys to do his weekly shop and simply plodding along in life. Gets on well and socializes and is good as gold to his fellow gentile friends and community. And just being a non-active secular Jew, with a pinch of Jewish identity; small cultural things, such a enjoying Jewish foods, and enjoys the occasional Jewish dancing at a Jewish wedding. Or Jacob B doing all of this, but ………….. proactive in supporting his tribe. Actively involved in local Jewish events; fund-raising for the local synagogue, a bias supporter of israel – no matter what they do. An advocate for Jewish advancement. Insists on circumcising his children and grandchildren. And deep in his heart, feels his people are somehow that bit special, chosen and indeed superior. I think this is what we’re talking about. There is a clear difference. It seems to all come down to each person’s intent. The Jacob A’s in the Jewish community are very much a threat to judaism. And that is why integration into normal humanity is discouraged. The Jacob A’s out there are really the trouble makers in the Jewish community, perhaps without them even realizing themselves. At this point I have to say the likes of Jacob A’s and his family are not really ‘the Jews’ most of us are banging on about. Although I feel they ultimately should do a Gilad and completely turn their backs on this mind-control cult. They should not remain neutral, passive observers of the crimes of their tribe. This is the only real beef we have with the Jacob A’s of the Jewish community. The deafening silence. So who are we specifically banging on about when we are cussing ‘the Jews’? I would say we are talking about the JCN (Jewish Criminal Network). So I thought about an acronym which may be useful to cover a range of ways to describe the active Jews who are really proactive in pushing or assisting this JWO agenda. The one’s who are cognitive of the talmudic teachings and the game plan of the Protocols of the Learned Elders of Zion. This is more of an umbrella term, because of course most of the Jews who are busy scurrying around getting up to no good, are in fact not elite at all. Their shenanigans are more on a street level, ripping us gullible goy off. They just can’t help themselves. But they do pertain to the talmudic principles of supremacism, they are playing a role in the organised Judaic crimes and generally support the zionist ideology. The second area – how about us lot? So we’ve all got halos on our heads have we? There was nothing our parents could have done to stop this darkness come into the world? What have we been up to most of our lives? Selfishly stimulated with our various activities? Are we really in a position to blame ‘those Jews’? We allowed the bully to bully us – and continue to. We did not get a grip of our fears – and continue to. We put spirituality to one side, whilst we got on with our lives. We were too busy being busy. And most of all we not only played the naive, innocent; gullible goy – the victim role. We are still actively assisting. Every day of our lives. We gentiles are the bailiffs doing all the physically fleecing for our overlords. We gentiles are the bodyguards (police) for the ZEOS bankers. We gentiles are the traffic wardens scooping up the artificial penalty fines on behalf of our judaic masters. We gentiles are eugeniqzing each other in fabricated wars on behalf of zion. We’re assisting in the logistics of their banks, poison foods, pollution of the environment, encouraging the voting fraud, vaccinating and inducing flu shots, incarcerating the good gentiles who dare complain about all this. It’s us us who is doing the physical depopulation control. We are carrying out the plans clearly laid out in the Protocols. Us. Our own worse enemies. I do think it is vitally important that we pay close attention to the power of reflective thinking. Being accurate in our definition of blame. Being crudely honest with ourselves. And most importantly – realise it is the dark demonic entities we are dealing with in this whole agenda. The Light vs darkness. Good vs evil. The Divine vs satan. And some would say our levels of consciousness. Why is it, that it is always you who are the eternal victim? Why is it, that it is only your race which has special historical sensitivity laws? Why have your people had endless pogroms throughout the centuries? Why is it always referred to as THE holocaust – your holocaust, when there have been plenty of real holocausts throughout history? Why do you not integrate into society? Why is it that you seem to think God chose you as his favorites? Why is it, wherever you have lived, you have always created ghettos for yourselves? Why do so many people, of all cultures, throughout history always hate the Jews? Why do you have to perpetuate this ‘never again’ mind set? Why does society have to predominantly keep hearing about the suffering of your race? Why has your tribe been booted out of 84 countries, 109 times throughout history? Yet again I have to say. Such a shame even though she is vocal about this, she probably hasn’t got a clue that ‘they’ and ‘the government’ and ‘the royal family’ are all judaic driven. Soon it will be like Charles Dicken’s times. Lots of people huddled together in cramped up housing units. 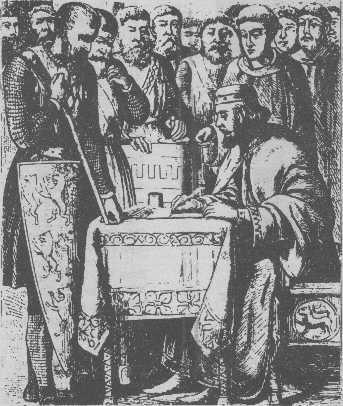 King Edward I grants Jews licences for trading and farming in the ‘Statutum de Judeismo’ (commonly known as the Anti-Usury Laws) in an attempt to discourage Jews from money-lending and coin-clipping. It was the first Act in which the new Commons took part, in conjunction with the King. To great popular acclaim, King Edward I issued an Edict declaring that all Jews must leave England by 1 November. The wardens of the Cinque Ports were to supervise their departure and see that the poor were able to obtain cheap tickets. No man was allowed to “injure, harm, damage or grieve” them. They were to be allowed to take all their cash and personal property, but their bonds and real estate reverted to the Crown, while synagogues became Church property. Demurrer by William Prynne was published, in which Prynne, a distinguished lawyer of Lincoln’s Inn, argued forcefully against Jewish readmission, quoting numerous authorities that having been banished by the King and a full Commons, and “never since could they obtain any priviledge to return hither again,” the banishment was of permanent effect. Cromwell, having executed King Charles I, readmits the Jews. The order leading to the execution of the King was drawn up by a Dutch Jew, Isaac Dorislaus, and approved by a rigged court. According to tradition, Cromwell had intended to sell St. Paul’s Cathedral to the Jews for use as their central synagogue. A Jewish Naturalization Bill (“the Jew Bill”) granted naturalization to Jews on personal application to Parliament. The Jewish Naturalization Bill was repealed following public demonstrations and protest. The first Public Order Act. Effective from 1 January 1937, it banned political uniforms and paramilitary groups. The law is now very arbitrarily enforced. The first Race Relations Act was introduced into the House of Commons by Sir Frank Soskice, an immigrant Russian Jew. The Runnymede Trust was founded by Anthony Lester and Jim Rose, both Jews, a few weeks after Enoch Powell’s ‘rivers of blood’ speech in Birmingham. The Jewish Chronicle of 17 January 1975 reported that “Section 6 of the Race Relations Act, 1965, dealing with incitement to racial hatred, may be amended and strengthened following representations made to the [Jewish] Attorney General, Mr. Sam Silkin, QC, by the Board of Deputies of British Jews. In the view of the board’s Jewish Defence and Group Relations Committee, the weakness of the Section is its present requirement that ‘intent’ to stir up racial hatred must be proven for any prosecution to succeed.” The Editorial expressed satisfaction with the result, but said that it “would better have been achieved by less publicised means.” The Race Relations Act duly removed the need to prove ‘intent’ in prosecutions for ‘Incitement to Racial Hatred’ and was passed in the House of Commons with only 132 of its 635 Members being present. Throughout the 1970s and 1980s Neville Nagler, a synagogue official, was the head of the Home Office department responsible for race relations matters. Whenever a Cabinet Minister made a speech on the subject, notes for the text were always drafted by Nagler, who routinely consulted officials at the Jewish Board of Deputies such as Geoffrey Bindman and Anthony Lester. The 1986 Public Order Act was placed before parliament by the Conservative Home Secretary, a Jewish immigrant from Lithuania, Leon Brittanisky, also known as Leon Brittan, assisted by his cousin, another Lithuanian Jew, Malcolm Rivkind, also know as Malcolm Rifkind. Official commentary on the law explicitly refers to the Runnymede Trust. A further raft of race law was introduced, overseen this time by a part-Jewish Home Secretary, Jack Straw. Around 27 offences carry increased penalties if the offence is deemed to be “racially aggravated.” The maximum penalty for ‘Incitement to Racial Hatred’ was raised from two to seven years.